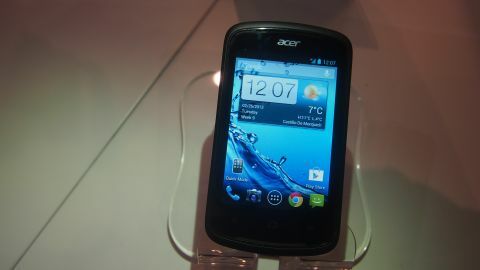 I tisn't going to win any awards but we like the Acer Liquid Z2. Check it out if you have a technophobic friend or relative who quakes at the thought of touching anything with silicon inside it. Just don't tell them it has silicon inside it. So the Acer Liquid Z2 is not going to set the mobile world alight, but we quite like it all the same. It's designed primarily as a first baby step into the smartphone world and comes with some helpful features to make the transition as painless as possible. It's a fairly dinky little thing to look at and comes with a 3.5-inch 480 x 320 display, 1GHz single-core processor, and a 3MP camera. As a resolutely budget device, it does not feel like a premium smartphone, but it's small and light and certainly isn't horrible to look at and fondle in the hand. There are uglier phones out there that cost twice as much. That said, it is quite a fat device for something so small, but at least it's not heavy. The great thing about this little phone is that even your mum's silly friend who dresses too young for her age and pretends not to understand the TV remote will be able to use it. It comes with an app called 'Quick Mode' which is essentially an app launcher designed for people who don't know what Android is and don't want to know. Open it up and it gives you all of the main settings, functions and apps in one menu. Things like Bluetooth on/off, camera, browser etc. All of the things a technophobe needs to make use of a smartphone without trying, basically. This all runs on top of a mostly vanilla-flavoured build of Android Jelly Bean 4.1, and even though it has low-end specs, it still manages to be nippy and responsive to the touch. There was no sluggishness, and the camera - which "launches in just one second" - was able to fire off snap after snap without any focus or save lag. OK, so it's not going to win any awards but we like the Acer Liquid Z2 and look forward to putting it through its paces in a full review. We give it a tentative thumbs up for the time being and encourage you to check it out if you have a technophobic friend or relative who quakes at the thought of touching anything with silicon inside it. Just don't tell them it has silicon inside it.